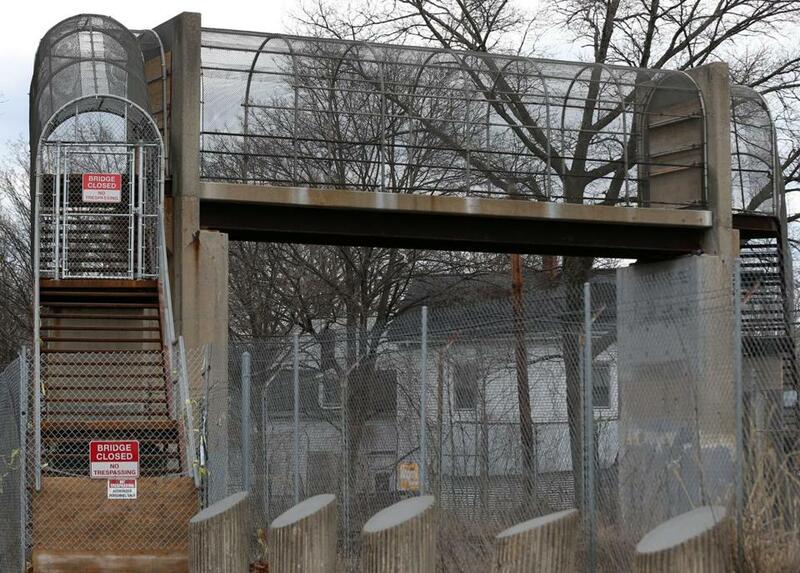 The MBTA has fenced off the pedestrian bridge between Ceylon and Bird streets, provoking the ire of Roxbury residents. When it comes to dissatisfaction with a public agency, most residents opt for a vexed phone call or a strongly worded e-mail. But on Ceylon Street in Roxbury, residents have taken a different and much more public tack. “FIX THE BRIDGE — NO EXCUSES,” read a wooden sign that appeared last month, propped against the pedestrian bridge that straddles commuter rail tracks and connects Ceylon and Bird streets. The bridge, built in the 1980s, has caused angst in the community for years. Residents have complained to the T that it has been allowed to fall into poor repair, plagued by graffiti, loose steps, rusting metal, and dilapidated fencing. At night, the bridge is pitch-black, and residents said they do not feel safe using it. The bridge had lights in the past, but they had been removed because of problems with vandalism. Soon after the article came out, the T finally took action: It closed the bridge, erecting a plywood barrier and chain-link fence and putting up a “NO TRESPASSING” sign. “Until a solution is identified, the bridge must remain closed for safety reasons,” said Joe Pesaturo, a spokesman for the Massachusetts Bay Transportation Authority. That wasn’t exactly the solution residents were looking for. They posted the handwritten “FIX THE BRIDGE” placard to air their frustration with passersby. Now, MBTA and city officials are playing a game of not-my-problem hot potato, saying that responsibility for getting the repairs done do not fall under their purview. “The Ceylon Street bridge was built about 30 years ago at the request of the city and the community with the understanding that the city would handle the bridge’s maintenance requirements,” said Pesaturo. “The bridge is owned solely by the MBTA, and over the years they have periodically done maintenance work on the bridge,” said Kate Norton, spokeswoman for the Boston mayor’s office. An official with knowledge of the situation said the T has conducted a “field observation report” on the bridge, but two hurdles stand in the way of any imminent solution: Fixing the bridge would be expensive at best, but costs could be higher because it might be subject to American Disabilities Act requirements that would necessitate the installation of a wheelchair ramp to pair with the steep staircases. It’s been several months since the closure of the interior stairway and escalators at South Station, which connect the Red and Silver line platforms with the station’s main atrium and commuter rail terminal. The construction project on the stairs has detoured tens of thousands of passengers, forcing them to use the stairs outside the station, on Summer Street. It wasn’t the end of the world, though several irritated readers shared stories of almost-missed trains and commuting headaches because of the crowds that needed to be diverted to the outdoor stairwell. The stairs were scheduled to reopen March 31, but that date came and went. But, finally, they are ready. Julia Tanen, spokeswoman for Equity Office, the company that holds a 30-year lease for the commercial space in South Station, said the stairs would reopen Sunday, in time for Monday’s commute. New York’s MTA has done it. Chicago’s CTA has done it. And finally, Bostonians will have the chance to experience the pleasures of poetry on the MBTA. Mass Poetry, an organization dedicated to promoting poetry in Massachusetts, announced this week that they are bringing poems to advertisement spaces on subway cars. The initiative, dubbed PoeTry, is part of the organization’s Poetry in Public Spaces initiative, which began last year, said Mass Poetry program director Laurin Macios, and it may be a first. The organization does not know of any similar initiative taking place on the T in the past, she said. Because April is National Poetry Month, Mass Poetry has paid for the April round of subway car poetry, which features three poems from contemporary writers; an anonymous donor has paid to help extend the program into May and June. The organization is setting up a donation website for others to help finance transit poetry through the rest of the summer. Each appearance of a poem includes a tearsheet on the corner of the sign, allowing passengers to take a copy of the poem with them if the spirit strikes them. O’Neil said the poems were chosen based on their ability to speak to the venue of a T car, or the passengers who ride it. “Marathon,” by Nick Flynn, written in the aftermath of last year’s bombing, was an obvious choice for April.